You'll need a facility to start the newest GTA heist. Here's how much that'll cost you. GTA Online's Doomsday Heist is now live as part of the game's latest update. To begin the heist, you need to buy a new building called a facility from Maze Bank Foreclosures. The cheapest one will set you back $1.25 million of in-game cash, while the most expensive option costs $2.95 million. You can also install an optional orbital cannon, which costs $900,000. Is that basic cost justifiable? If you go for a cheaper option and play GTA regularly, I think that sounds okay, although I'll have to play the heist first to make a proper call on that. 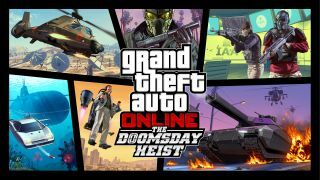 According to IGN, Doomsday Heist features about 12 hours of new stuff, which is about as long as I played each GTA IV expansion back in the day. In real money terms, $1.25 million of in-game money costs £12/$20 in Shark Cards. I've bought the facility closest to my hangar at Zancudo, which is $1.67 million. To use it as a spawn point, though, I'll need to buy sleeping quarters on top of that, which is another $290,000. You need to be a CEO or MC President to start the heist. The GTA Online subreddit has a really handy breakdown of the costs for new vehicles, facilities and more. As mentioned, you can have an orbital cannon added to your facility for $900,000, but according to the same thread, it costs $500,000 per manual shot or $750,000 per automatic shot (with a long cooldown), which I can't ever see myself spending. I can't verify those prices, though, because it requires more spare money than I have right now to buy one. I've just downloaded the update, and visited my facility to begin the first setup mission, after watching the opening cutscene. There's a $65,000 upfront cost for that. As for the rest of the expansion, I'm unsure, but my aim is to play it across the next week and deliver some verdict on the quality of the new missions in Doomsday Heist. I'm excited, though, and even just having a sudden drop of new missions, vehicles and so on is pretty cool, this deep into the game's lifecycle. As ever, there's a bunch of stuff I'll never spend money on, then a few items I find tempting. Let me know your thoughts on the pricing and new content below.